Just looking at Japanese people can make me hungry. Looking at this picture of braised daikon and mushrooms does the same. Japanese is one of my favorite cuisines that I rarely cook at home. The recipes can be complex and time-consuming and require a lot of ingredients, some of which can be a schlep to find even in New York. Then you wind up with a lot of odd ingredients in a city where space is limited and Japanese restaurants are plentiful. I like to preserve the “magic” of Japanese food by eating it out. By “magic,” I mean I can just enjoy the flavors and the artistry of the food someone else has made without deciphering it and and figuring out how to replicate it at home. However, this dish of braised daikon radish and mushrooms is very simple. Although the flavor of daikon radish varies from plant to plant, I find them to have a more delicate flavor than the more common red radishes. Braising helps mellow the flavor of the radishes even more. The umami combo of the mushrooms and the soy sauce balances beautifully with the sweetness of the mirin. Although this is a vegan dish, it packs an almost meaty punch. This dish exemplifies what I love about Japanese cooking. It combines simplicity, elegance and the “POW” factor of umami flavors. 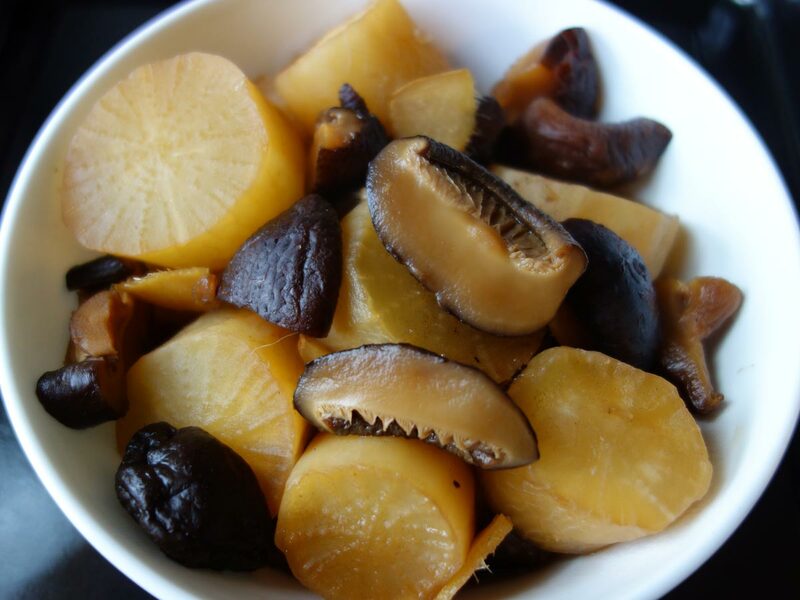 Rehydrate the dried Chinese mushrooms by soaking them in boiling water for 30 minutes or cold water for 2 hours. Remove the tough stems or pieces and slice mushroom caps into quarters or slices. In a medium saucepan, combine dashi, mirin, tamari (or soy) with ginger and salt and bring to a boil. Add daikon and mushrooms, turn down to just simmering and cook until the radish is tender about 30 minutes. Serve hot or room tempeature. I use the dashi tea bags that you get from a Japanese grocery store.